I love this story, having heard and read it many times before. You probably have too. The imagery put me off a little at first – using wolves as the metaphor for our two inner selves. I associate wolves with aggressiveness, fearlessness and a very hostile reaction to Little Red Riding Hood’s grandmother, despite my awareness that they are also nurturing, protective and inclined to stay with their pack. So retrospectively – it seems the analogy is perfect, doesn’t it? We choose everyday. Certainly in the law firm environment in which I worked, I saw far more self-serving behavior than anything else. The intensity of the competition, the race to be the best, the ego needs that demanded assuaging, the unspoken reality that you ‘eat-what-you-kill’. The challenge – which was honestly fun to accept – was choosing to remain part of the firm’s collective conscience. Did I do this perfectly? Absolutely not. Was the lure of inferiority nipping at my heels – you’re kidding, right? This is me. Of course it did. And did I act at times out of anger? Yes although probably more in a passive aggressive way, because in that regard I’m wrapped pretty tight. This isn’t about me though – it’s about you. Do you realize the elements within you that aren’t aligned – the ‘ fight’ if you will for emotional sustenance, attention and control that wrestles within you? Certainly it is far preferable to feed the goodness, cultivate it, share it – make it the stronger part of who you are, so that you look upon the end of each day as one you lived well. Sometimes though, we do feed the wrong elements of our being – do you know when you’re doing it? When at work? At home? How does it reinforce the perception that others have of you? Thoughts for a Wednesday morning, considerations for a lifetime? Choose well today my friends and make it a good day. Posted on June 13, 2012 by mimijk •	This entry was posted in friendship, inspiration, leadership, life lessons, management, mindfulness, motivation, work life and tagged Passive–aggressive behavior. Bookmark the permalink. ← Of Love and Turtles and Lifetimes, Oh My! I’m gonna have to pour a fresh cup of coffee to give this post its due! 😉 Seriously, wonderfully provocative. Brings to mind a quote by the artist Paul Klee that I like very much. “A single day is enough to make us a little larger or, another time, a little smaller.” Always shooting for larger–in spirit, in compassion, in joy, in thankfulness, in generosity, in peace…. I might have read this one a little too late today. Perhaps tomorrow I will make better choices. Thanks for trying to save me from me. I’m SO glad the timing of this post was right for you. 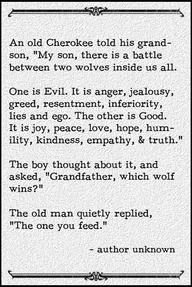 I think we all ‘feed the beast’ at times. It’s just so damn easy to do. Somehow the act of nurturing the good takes more consciousness, perhaps? Enjoy today – and the fact that you are taking care of the better part of your soul.. I also hwve taken that story to heart. Thanks for the reminder of its poignancy. Me too – I was really happy when I happened upon it.. I think about this all the time. I constantly see people who choose to give in the the “bad” wolf as if they have no control. I keep telling them you can choose every morning to be the best version of yourself. This is a great story Mimi, I blogged it a long time ago and have wanted to rerun it, thank you for doing so. It is our choice, and we are accountable for it. It is a great story..and a good reminder!! 🙂 Enjoy your day!! Nice story. actually, the wolf is one of a number of animals that greatly resemble the human being. Pigs and rats also fall into that category. We know the wolf a bit, through his relative, the dog. The wolf has many of the same characteristics, and is even more loyal. He is a very social animal. Even the bad wolf, that we’ve gotten to know through mythology could very well present the human being, the way he is seen by other creatures on this planet. Thanks for sharing these thoughts. I couldn’t agree with you more – both pragmatically and figuratively. Do we represent the best part of our character to others who can do nothing for us? Or are we continually searching to self-satisfy our needs (which seem to grow exponentially and ridiculously at times)?